Lazedrick Thompson makes a run in a game against Memphis Oct. 14, 2016 at Yulman Stadium. Every year when the NFL Draft approaches, 253 players will hear their names called and see the fruits of their labor finally pay off before their eyes. For the thousands of NFL hopefuls who don’t hear their name called, it’s business as usual. Among these undrafted hopefuls is former Tulane running back Lazedrick Thompson, whose patience paid off shortly after the end of the draft. “In less than five minutes of the draft being over, I received a call from my agent asking if I wanted to go to the [Arizona] Cardinals camp,” Thompson said. NFL Rookie Minicamps are a place where players like Thompson are given a chance to prove themselves to teams that are considering signing them as undrafted free agents. The Arizona Cardinals’ camp was held May 12-14, and Thompson felt as though he put on a strong performance. As many as 20 to 25 undrafted rookies will be invited to each team’s training camp. Few will be signed to the preseason roster, and even fewer will make the final roster for the regular season. Of those undrafted free agents who make regular season rosters, only a select handful will make a name for themselves in the NFL. Among the undrafted free agents currently in the league who have done this are several former Tulane players, two of whom—Orleans Darkwa and Robert Kelley—were running backs at the same time Thompson was on the roster. Thompson is only motivated by the odds stacked against him, as he feels he has a lot to offer a team. “Understanding of the NFL protections is simple to me,” Thompson said. The goal of playing in the NFL has been on Thompson’s mind for quite some time. During his sophomore year at St. Charles Catholic High School he began to draw attention from Division I schools including Tulane, before going on to win a state championship his junior year. After committing to Tulane, Thompson suffered a knee injury, ending his high school career, but he was undeterred. 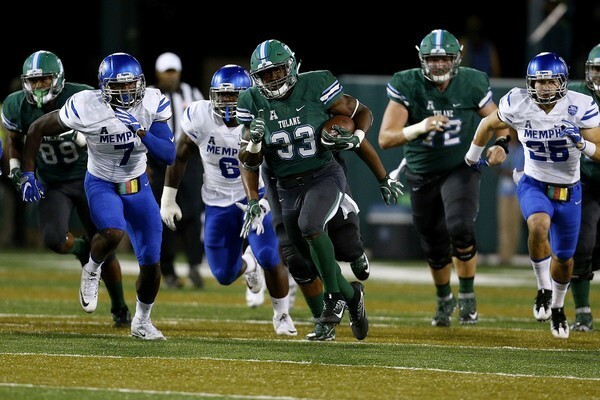 Racking up over 1200 career rushing yards at Tulane, Thompson become a key part of the offense his senior season, with some guiding advice from his coaches helping to keep him grounded. Thompson is not the only Tulane graduate to work out with an NFL team this offseason. Defensive end Royce LaFrance, offensive lineman Chris Taylor and fellow running back Josh Rounds have all worked out with NFL teams, while linebacker Nico Marley has already signed a contract with the Washington Redskins. After a strong showing in Arizona, Thompson is hoping for a contract himself. “I’m just staying positive and working out, hoping I get a phone call,” Thompson said. The NFL preseason starts with the Hall of Fame game on August 3, but most teams finish signing undrafted free agents by mid-July, when training camps begin. Thompson hopes he can make his dream come true, not just for himself, but for his parents, who have supported him throughout his journey.